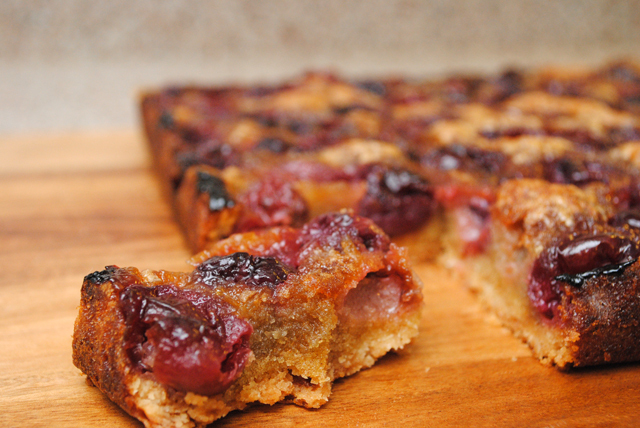 The cherries at the market today looked so appealing, I bought them without a plan and baked these cobbler/bars a few hours later by combining several recipes from my favorite cooking blogs. Preheat the oven to 375 degrees-F. Melt 7 Tbsp. butter and set aside to cool slightly. Combine melted butter, 1/3 cup sugar, and 1/2 tsp. vanilla extract in a medium mixing bowl. Add 1 cup flour, and 1/8 tsp. salt and mix until dough forms. Line an 8-inch x 8-inch baking dish with parchment paper and grease with 1 Tbsp. softened butter. Pour crust dough into the pan and press with the back of a spoon to flatten the crust and fill the pan. Bake crust for 20 minutes, until lightly browned. Leave in the pan and transfer to a cooling rack until ready to add filling. While the crust bakes, remove and discard pits and stems from the cherries and set cherries aside. Melt remaining 1/2 cup (1 stick) butter and brown butter by cooking for 5 to 7 minutes. Set aside to cool slightly. In a medium mixing bowl combine remaining ingredients: melted butter including any darker solid bits, eggs, 1/3 cup granulated sugar, 1/4 cup brown sugar, 1/2 cup flour, 1 tsp. vanilla extract, and 1/8 tsp. salt. Place cherries on top of baked crust. Pour filling over the cherries. Bake for 45 minutes or until toothpick inserted comes out clean. Transfer to a cooling rack to cool completely before removing from the pan. Discard the parchment paper. Cut bars and serve. Store at room temperature.